where F is the applied force and a is the "inertial" (whatever that means) acceleration. -(m+M)g$. However the acceleration is different because the blocks are connected via a piece of string. Rather m accelerates upwards and M accelerates downwards so total acceleration of this unit is -(M-m)a downwards. The minus sign shows the net acceleration is downwards. Now because we are subtracting this term it becomes a plus in the equation below. I managed to get agreement with the worked example but is my reasoning correct? ...where F is the applied force and a is the "inertial" (whatever that means) acceleration. 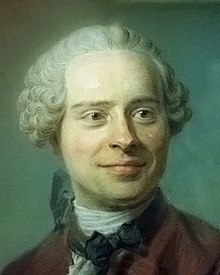 D'Alembert defined I = -ma to be the "force of inertia." Not to be confused with "inertial force" which is an entirely different concept. Yikes! Now please check my analysis. I would except I'm watching Battlestar Galactica. This has been a good day for me since my chronic pain has been minor. Otherwise I find it hard to concentrate on any subject. Maybe some other day/time I can dig deep and check this stuff out for you. It's not as though one doesn't get rusty in such things, otherwise I'd be able to tell almost at a glance if it was right. I would except I'm watching Battlestar Galactica. I tried watching that once, the remake, but found it a bit grim. Thanks for all your help. Last edited by kiwiheretic; Aug 20th 2017 at 08:56 PM. Here he is !!! one of the two men who had the effrontery to claim as their own the simple pulley ... what a cheek to call this D'Alembert and Atwood's machine ... it's a frigging pulley ..
And the most simple one imaginable ...no friction or inertia in the pulley!! So we have one mass going up , one mass going down where's the problem ? The Atwood machine (or Atwood's machine) was invented in 1784 by the English mathematician George Atwood as a laboratory experiment to verify the mechanical laws of motion with constant acceleration. Atwood's machine is a common classroom demonstration used to illustrate principles of classical mechanics. Newton's laws were published in 1687 so it was a little over 100 years after that when Atwood accomplished this particular verification of mechanics. Do you understand that? I.e. do you understand the following two key points? You appear to be in the habit of making false accusations before taking the time out to learn what it is you're talking about. You should learn how not to do that. By the way, D'Alembert absolutely nothing to do with Atwood's machine since he died a year before it was invented. Don't you ever attempt to verify your claims before you make them???? Last edited by Pmb; Aug 20th 2017 at 09:31 PM. It's still just a pulley ...and existed thousands of years before those two did a few experiments with it . That maybe so but it's used in lots of physics problem to illustrate solutions to different mathematical physics techniques and I know that sounds like throwing around mathematics for its own sake but D'Alembert principles are a precursor to the Euler-Lagrange equation which is used in simplifying problems that would otherwise be hard in conventional co-ordinate systems (eg Euclidean, Polar, Spherical, etc). It's all part of a larger subject of generalised co-ordinates. Try and solve the equation's for the double pendulum in traditional co-ordinates and see how far you get. In this case I think there is a legitimate need for this particular mathematical machinery. With Lagrangian Mechanics you only need to bother with the stuff that is changing and not have to massage it into your co-ordinate system. Re - "It's still just a pulley ...and existed thousands of years before those two did a few experiments with it "
That's incorrect. 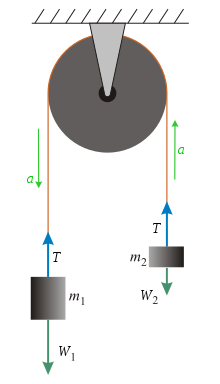 Atwood's machine is not simply a pulley. It's a pulley which has a weight on each string/rope and is used to verify classical mechanics whereas a mere pulley is used to raise an object which is on one end by a person or animal pulling on the other end. Besides, Atwood's machine is not defined to be just any use of a pulley but a particular use of one. As to when it first came into existence I think your statement "thousands of years" is imprecise since that could mean 2 thousand or 10 thousand and it was invented closer to the former rather than the later. Tell me Oz. Why is it that you appear to be in such a rush to poo-poo a physicists theory, experiment etc rather than being more anxious to learn about the how and why such things are the way they are. You have nothing to gain by your current use of posting but stand to gain a good deal of knowledge if you instead first learn what it is that you're claiming to be so wrong. I guess that's more of a rhetorical question than anything else since I'm pretty certain of how you think of such things. Last edited by Pmb; Aug 21st 2017 at 08:49 PM. Splitting hairs??? A pulley is not in use unless it has something pulling on both ends !!! Tell me Oz. Why is it that you appear to be in such a rush to poo-poo a physicists theory, experiment etc. from wikipedia ..."The Atwood machine (or Atwood's machine) was invented in 1784 by the English mathematician..."
And here's the machine he/they "invented".....!!! I think the sketches here show some hybrid of Atwood's Machine. Am I right? was not like the figures posted here. the speed of the downward motion. I wrote this technique up some time ago... Perhaps of interest.